How is it already less than three months to go until our wedding? Time is going by so quickly and I’m actually panicking a little about things we haven’t done yet. 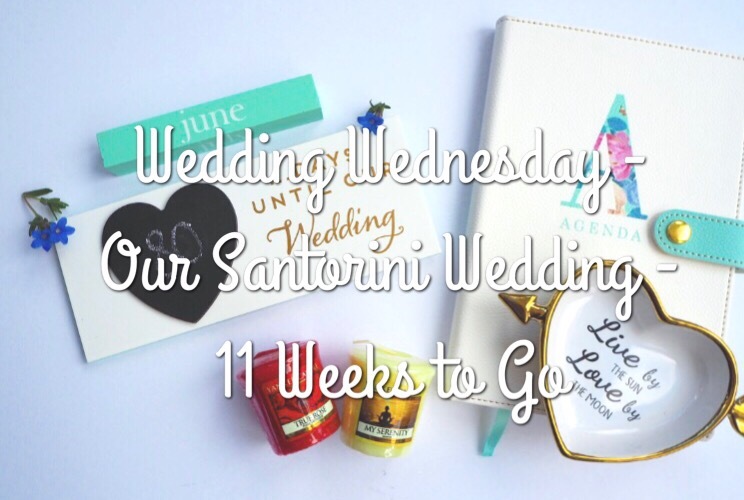 The main advancement this week has been contact from our wedding coordinator in Santorini. We had been made aware that they don’t start plans until a few months prior to the wedding, but I still found it hard not having any details before now. Unfortunately this ended up putting a dampener on things as our package wasn’t as good as it first seemed and we came up against lots of issues when trying to finalise details. I got in contact with Perfect Weddings Abroad and they’ve resolved most of the issues. Hopefully I can feel more positive about the wedding going forward. Having given up on finding a matching outfit for the boys, as their ages just don’t work for most shops, I finally came across two that are very similar in Matalan and Not on the Highstreet. Fingers crossed they look nice together! We’ve decided to stay at the airport hotel the night before we fly, which will hopefully make things a little less hectic. After our nightmare airport experience when we flew to and from Spain I’m taking extra care to make sure we don’t have issues with our luggage or departure times for Santorini. I had a post published on Bride Magazine website last week, which I was really proud of, talking about my reasons behind having my nan as my bridesmaid. We had our meeting with the registrar on Monday this week so that’s another big item ticked off the checklist and the legal paperwork is now in motion! It’s all very tight deadline wise so I think I won’t relax now until the documents have been given the ok by the wedding company! Having your nan as a bridesmaid is a wonderful idea, I’m sure she’ll love it. I’m glad you managed to get some issues resolved with the company. I’m sure it will be a really special day for you all. Wow how exciting. I’m sure once you’re there you’ll forget all the minor details. I’ve always wanted to go to Santorini! oh how exciting for you! Hopefully you can build on the excitement now the coordinator has been in touch and set everything rolling properly! Santorini sounds amazing and I am sure it will be an amazing day! We had our wedding in the Maldives and honeymoon there after of course, best decision ever! I am super excited for you guys! As stressful as it is, I know you have it all under control.